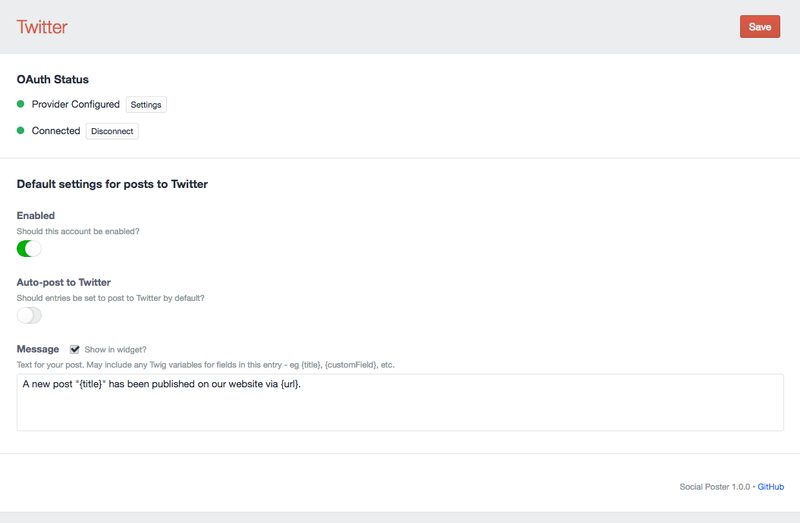 To get started, visit the Social Poster plugin settings page. Here you'll have options on which sections you wish to enable the Social Poster Widget on, and configure your social media providers. The Accounts tab shows all available providers that have been added through the Dukt OAuth plugin. Please consult the OAuth Documentation for instructions. Editing an account is in two distinct steps. First, you must have configured the provider through OAuth (click on Settings button), and also successfully connect to the provider (click on Connect button). Once this is done, you can edit the default settings for posts to this social media provider. You can enable posts to be automatically sent to social media when an entry is saved, or turn off to allow the entry editor to choose. You can also define a default message, and select an Asset field to fetch an image for use in the post.